– durability setting ( innodb_flush_log_at_trx_commit = 0 or 1 ) ? – do we have sync_binlog options. So why would not take these as variable parameters and run simple benchmark. and used Dell PowerEdge R900 with 16 cores, FusionIO as storage for table and RAID 10 with BBU as storage for innodb log files, innodb system table space and binary logs. 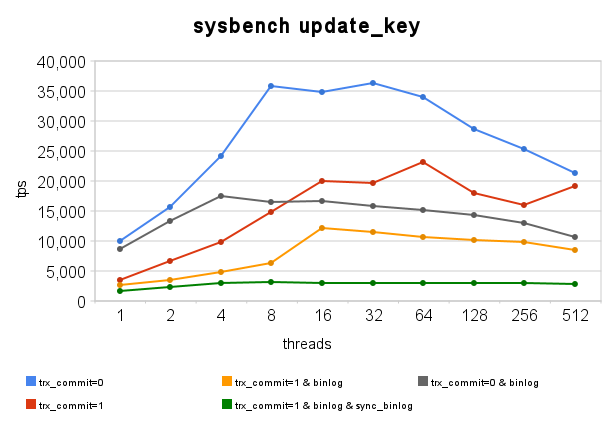 And I used Percon-XtraDB-5.1.43-9.1 for benchmarks. All used partitions are formatted in XFS and mounted with nobarrier option. I found results being quite interesting. With enabling binary logs, the results drops to 17451.01 tps with innodb_flush_log_at_trx_commit = 0 and to 12097.39 tps with innodb_flush_log_at_trx_commit = 1. So with binary logs serialization is getting even worse. 3086.7 tps. So this is good decision if binary log protection is worth such drop. – should innodb_flush_log_at_trx_commit = 2 change anything on this ? – if you use replication, by default tutorials put you on the green curve. Would you advise moving to “trx_commit=1 & binlog” or even “trx_commit=0 & binlog” ? Hi Vadim! Really cool article! BTW, I was wondering how does XtraDB and the like behaves over different RAID-10 stripe sizes and the fact that actually a lot of Linux distros don’t have their default partition boundaries aligned on raid stripe sizes (due to 63 sector offset from a msdos partition table). Have you ever considered (or have any plans) in making those tests? It would be great to see how XtraDB behaves on unaligned vs aligned systems. About 3.5K writes per sec. 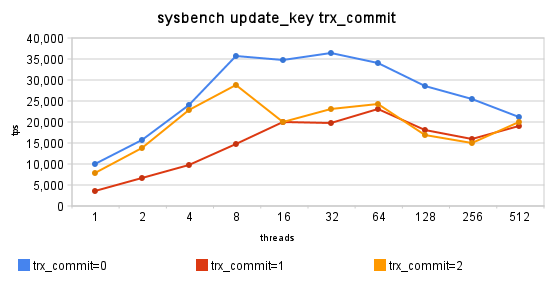 That hump at 64 threads in trx_commit=1 is pretty interesting, assuming it isn’t a fluke in the data. What caused the huge discrepancy between the 50% you measured and the 1% according to MySQL manual? 2) If the binlog IO is the bottleneck, would putting binlog on FusionIO (instead of RAID 10 HDD) speed things up? 3) What about innodb_support_xa? Will enabling that cause a further significant drop in performance? In any case it looks like sync_binlog has very bad overhead. 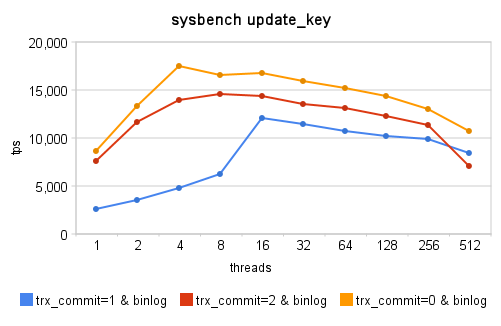 in innodb_flush_log_at_trx comit=1 you should have 2 fsync per commit in single client (because of XA) with binlog it should be 3 as I understand – the fact performance gap is much larger is different. Does group commit works on stage of writiting to binary log or is it only on transactional log commit ? I have been wondering about Power7 / IBM architecture and so-called “high-end” server testing for MySQL. Obviously, the Power7 architecture is pound-for-pound more powerful than any Intel platform — Sparc isn’t even a consideration. I’d love to see the same tests run on the new 750 series Power7 CPU’s and hardware from IBM. My guess is that we’d see another full CLASS of hardware / performance benchmarks unlike any yet seen…. I would also like to see results for Power CPUs, at least the ones that have high clock rates. Important thing here I’m not sure of. CPU doesn’t really matter here much actually. Do you have your write cache on your raid controller set to Write through or Write backed? Seems too slow for some of the tests you did for the hardware you have this is why I’m asking. With write backed you don’t usually see that much difference if raid controller is properly configured and working, it’s nearly like writing to memory rather than disk. Was your BBU in re-learn mode at the time?